Waste not | Be Nice. On Memorial Day weekend when many Americans are chowing down and drinking to their hearts’ content, I think a lot about all the food being tossed in the trash can. Think about it for a second. How much of our food goes down the kitchen drain and the garbage disposal? How much goes in those airless plastic bags destined for a landfill? In a world with a growing fresh water shortage and a food crisis in a number of regions around the world, perhaps it is time we be a little more mindful about our consumption on the most basic level. Ordering Fish and Chips? Ask them to leave off the tartar sauce if you don’t usually eat it. French fries: use smaller amounts of ketchup as you eat and add more as you go. Not a fan of the pickle? Ask them to leave it off, or give it to a friend at the table. Don’t hurt your leftover’s feelings: take them home to enjoy later. Traveling? Many hotels have mini-fridges for their guests if you request it. You could keep your leftovers there for the next evening. Freeze! Did you make too much soup or casserole? I do all the time – on purpose. Freeze your leftovers for lunch at work (Pyrex makes great glass 2-cup containers). Bonus: keeping your fridge and freezer half-full (but not packed solid) actually helps it cool more efficiently! Want a couple “big” ideas? Compost! Read what the EPA has to say about that here. Petition your local government to include composting as a part of the municipal waste management. Seattle does it. So could your town! Open a restaurant! Every item that is returned uneaten could be composted. AND you could feature an “a la carte” menu so people only order the dishes and sides they want. How many people would rather have the salad than the fries? Imagine the cut in waste if we could pick and choose what appeared on our plates! And of course there are the biggies: install a grey water system, plant native plants to your region in your yards, collect your rain water, and so on. For more tips I have “reblogged” a post by The Frugal Goddess. She has a very practical perspective about food waste. For those less concerned with the world-wide issue of over-consumption The Frugal Goddess also addresses the hit our wallet takes when we waste. Us Americans waste around 27 percent of the food we purchase, according to Michael Webber, associate director of the Center for International Energy and Environmental Policy at the University of Texas*. Maybe we can start to change that figure! It always starts with you! This entry was posted in At events/lectures/performances, At the Store, Be Nice. Challenges, Perspectives on Be Nice., To your environment and tagged American Wasteland, Center for International Energy and Environmental Policy, composting, Environmental Protection Agency, EPA, food, Jonathan Bloom, menu, Michael Webber, waste by Jen. Bookmark the permalink. 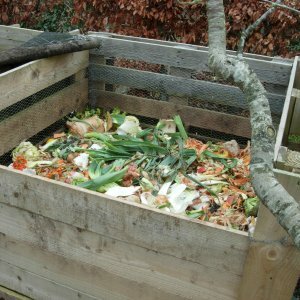 composting is great for your home gardens too!!! Egg shells especially fortify your soil. those are some great tips as well. Cutting back just a little proves to be big in the grand scheme of things. thanks for the post!